Lawn has very little to offer in the way of habitat value, so every square foot dedicated to traditional lawn can be thought of as habitat stolen from butterflies, birds and all the other critters that live in Southern California. Sometimes the choice is a cultural one. An arty neighborhood or hillside community is more likely to accept the removal of an entire lawn than a neighborhood of cookie-cutter houses with lawns to match. One of my favorite quotes is, “People who have never voted maintain their civic duty by mowing the lawn.” While some of us are courageous ground-breakers, willing to take on their neighbors or their city, others prefer ease in the neighborhood. Lawn is functional if you have toddlers or dogs and prefer lawn areas for them to run around on. If you are making the choice on behalf of a small child, remember that uneven ground with different surfaces to walk and run on may stimulate more connections to form in the brain. Flat lawn may not equal smart child. Having butterflies, hummingbirds, lizards and other local critters in the yard teaches kids that they are part of an ecosystem. A family I know had a toad come to their Glendale native garden. For some families, playing ball is important, and that does require some type of lawn, though it doesn’t need to be grass. Sometimes a best choice is to have a small meadow area that isn’t ‘real’ lawn, but uses natives that look green but use less water, and don’t need to be mowed or fertilized. Such meadows can be tolerant of heavy foot-traffic and even dog-traffic resistant, although you folks with digging dogs are on your own. I do have clients who have made a ball-playing lawn using a native sedge species. Your landscape choices may be guided by the type of lawn you have right now. Stoloniferous grasses like Bermuda can be difficult to remove, and can invade adjacent native planting beds, but do require less water. St. Augustine grass is more easily confined to a smaller lawn area or removed through hand-digging or with a sod-cutting machine, because the stolons are not as deep or persistent. A tall fescue or “marathon-type” lawn requires more water, and while shrinking the lawn will give you some relief from water bills, integrating this type of lawn with lower-water natives will be harder. Higher-water natives, such as those from riparian areas can be planted instead for added habitat value, but little water savings. 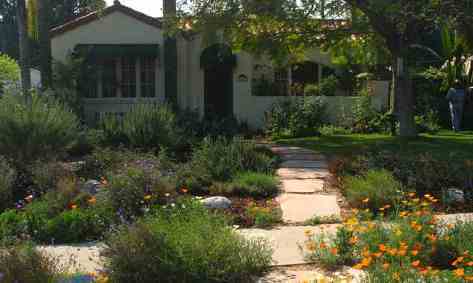 Under the City of Los Angeles Department of Water and Power’s (DWP) Residential Drought Resistant Landscape Incentive Program, the DWP will pay $1.00 per square foot to remove lawns and replace with native and drought-tolerant plants. Don’t just ‘go for it,’ since the DWP must send someone to your home to verify the lawn square footage. Other cities throughout California have similar programs, so check around and see if you can get a check for letting go of the lawn! This entry was posted in Garden Design, Habitat Gardening and tagged grass, lawn. Bookmark the permalink.